For a long time now the Fouesnant coast, also known as the Breton Riviera, has played the role of a temptress. The shores of the latter indeed conceal numerous treasures, including a multitude of creeks and beaches each more beautiful than the others. Amongst the latter, the Le Letty beach, adjoining the campsite, is certainly amongst the best preserved on the coast. This opens onto the Mer Blanche, a genuine inland lagoon, protected from the winds and waves of the ocean by the Mousterlin sand dune. 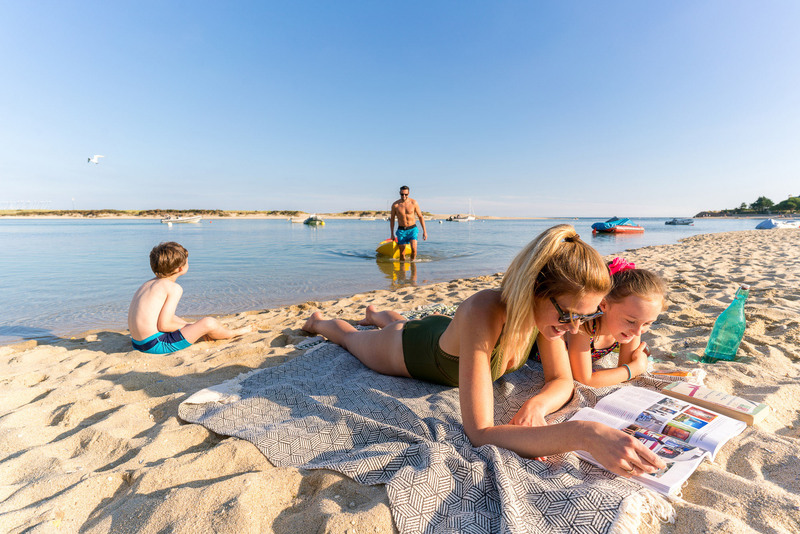 At any time, the Le Letty beach and its lagoon offer an exceptional show , which is directly accessible from the edge of the campsite: what could possibly be better? Governed by the rhythm of the tides, a highly pronounced phenomenon in Brittany, the beauty spot of the Mer Blanche and the Le Letty beach is completely transformed between high tide and low tide. During your stay, you are thus able to admire this picture-postcard landscape, which is constantly being renewed. The Le Letty beach rises and falls with the rhythm of the tides. At high tide, the Atlantic Ocean covers the turquoise water lagoon, and the water temperature increases as the water covers the sand, which has been warmed up by the sunshine. At low tide there are both a vast stretch of sand and several beach embankments on offer to you. Cross the lagoon on foot to join this dune ridge and admire the view both across the open sea, the îles de l’archipel des Glénan (the Glénan Islands archipelago) and across the Le Letty campsite!